This is a very tasty recipe which is versatile both for meat eaters as well as vegetarians. 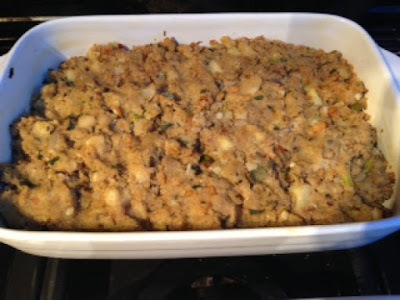 I did this at Christmas this year, when I needed to alter my usual Chestnut Stuffing, to one which was suitable for vegetarians, but still retaining the wonderful rich flavour at Christmas. I made this for the Christmas meal at church for 60, and the vegetarians could not believe it was really for vegetarians! I suspect that meant it was a hit. I also made it at our family Christmas lunch. Apart from anything, this is a nice winter recipe. We had it twice in December, and as soon as my family have forgotten about it, I will be doing it again. As a Stuffing, this recipe will serve 8-10 people. As a Main course, it will serve 4-6 people. It will keep in the fridge for a week, or will freeze. 12oz (unpeeled) parsnips. Peeled and chopped in small cubes. - Use a large frying pan and melt butter. - Add parsnips and onions and cook for 10 min or till soft. - Add rest of ingredients, including the contents of the frying pan. - Mix evenly with a wooden spoon or using your hand. - Use an oblong or square oven proof dish, and grease it with butter. - put all the mixture into the dish and spread it evenly. - Cover with tin foil. - Heat the oven to 200C, and put into the oven for 20 mins. - Remove tin foil, and leave in oven for 5 mins. - Remove from oven, and cut into portions. Serve with roast potatoes and steamed vegetables. Hello Marlyn Rodwell. So good to know you through your profile on the blogger and the blog post. I am glad to stop by your blog post which indeed waters your mouth seeing the delicious food in the dish. Your liking for Chicken curry has some Indian connection. I would love to have a hard copy of your recently published novel. I am so blessed and feel privileged and honored to get connected with you because of who you are in the Lord Jesus Christ. I am a Pastor from Mumbai, India and I love to get connected with the people of God around the world to be encouraged, strengthen and praying for one another. I have been in the Pastoral ministry for last 36 years in this great city of Mumbai a city with a great contrast where richest of rich and the poorest of poor live. we reach out to the poorest of poor with the love of Christ to bring healing to the broken hearted. We also encourage young and the adults from the west to come to Mumbai to work with us during their vacation time. We would love to have your grown up children with their friends to come to Mumbai to work with during their vacation time. I am sure they will have a life changing experience. We would also love to have you come to Mumbai with your husband to work with us during your vacation time. My email id is: dhwankhede(at)gmail(dot)com and my name is Diwakar Wankhede. Looking forward to hear from you very soon. God's richest blessings on you, your family and friends and also wishing you a blessed and a Christ centered months of rest of the year of 2016.